Create, Plot and Compare Replication Timing Profiles. The method is described in Muller et al., (2014) . Repliscope is an R package for creating, normalising, comparing and plotting DNA replication timing profiles. The analysis pipeline starts with BED-formatted read count files (output of localMapper) obtained by high-throughput sequencing of DNA from replicating and non-replicating cells. There are three methods of measuring DNA replication dynamics using relative copy number (Fig): sort-seq, sync-seq and marker frequency analysis (MFA). Sort-seq uses fluorescence-activated cell sorting (FACS) to enrich for non-replicating and replicating cells from an asynchronous population. Sync-seq requires cells to be arrested in non-replicating cell cycle phase (i.e. G1), followed by release into S phase. Samples are then taken throughout S phase when cells synchronously synthesise DNA according to the replication timing programme. In the case of MFA, rapidly dividing cells in exponential growth phase are directly used as the replicating sample, while a saturated culture serves as a non-replicating control sample. While the latter approach of obtaining cells is the simplest, it also requires deeper sequencing due to decreased dynamic range and, thus, is more suitable for organisms with small genomes (typically, bacteria). For best experience, use the Repliscope in interactive mode. To do so, simply run the runGUI() function. The typical command line analysis using Repliscope starts with loading BED-formatted read count files using the loadBed function. Various functions allow removal of genomic bins containing low quality data (rmChr,rmOutliers). To aid read count analysis, two visualisation functions are used: plotBed and plotCoverage. Next, read-depth adjusted ratio of reads from the replicating sample to reads in the non-replicating sample is calculated using the makeRatio function; the resulting ratio values are distributed around one. The normaliseRatio function is then used to transpose the ratio values to a biologically relevant relative DNA copy number scale (typically, from 1 to 2). The normalised ratio values are, essentially, replication timing profiles, where low values indicate late replication and high values - early replication. The plotRatio function helps to visualise the ratio values as a histogram. Genomic bins containing unusually high or low ratio values may be removed using the trimRatio function. smoothRatio uses cubic spline to smooth replication profile data. compareRatios can be used to calculate difference between two replication profiles using z-score statistics. Finally, replication profiles are plotted using the plotGenome function, which also allows for various genome annotations. 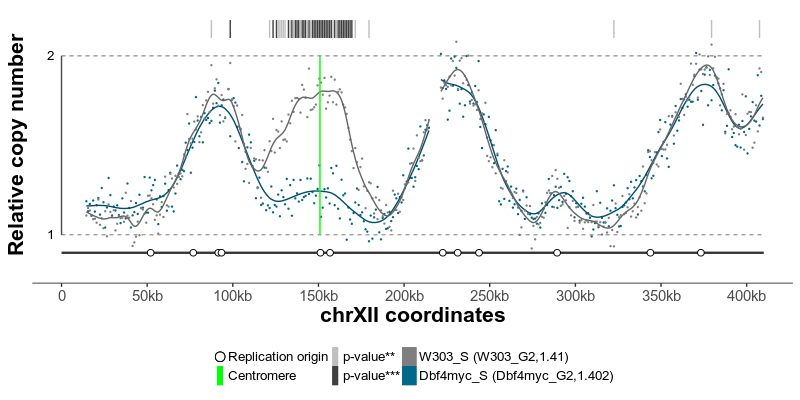 The replication profiles may further be annotated with additional genomic data, such as location of centromeres, known replication origins or other regions or points of interest. Two replication profiles may be compared to find genomic regions with statistically different replication timing. Resulting plots may be saved as pdf files containing editable vector graphics. 23 January 2019: First submission to CRAN.